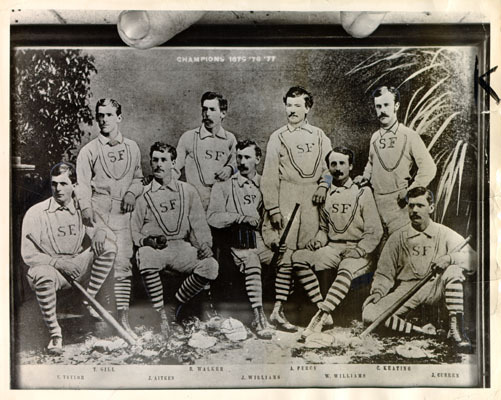 Title [Team photo of early ancestor of the San Francisco Seals] [graphic]. Location Folder: S.F. Baseball-Seals (See Also: S.F. Stadiums-Seals). Notes Newscopy (1950 Apr. 4): "AN EARLY ANCESTOR OF THE SAN FRANCISCO SEALS--This is the baseball club that represented San Francisco in 1875, 76, 77. What league it played in is not known, but printed on the top of the picture is 'Champions.' Note the uniforms and the mustaches. Standing are (left to right) T. Gill, R. Walker, A. Percy and C. Keating. Sitting are E. Taylor, J. Aitken, J. Williams, W. Williams and J. Curren."